TL;DR — WP App Store failed because I failed to get it into people’s WordPress dashboards, it didn’t really solve any painful problem, and there aren’t enough quality commercial plugins yet. But I pivoted a while ago and now have a thriving new business. 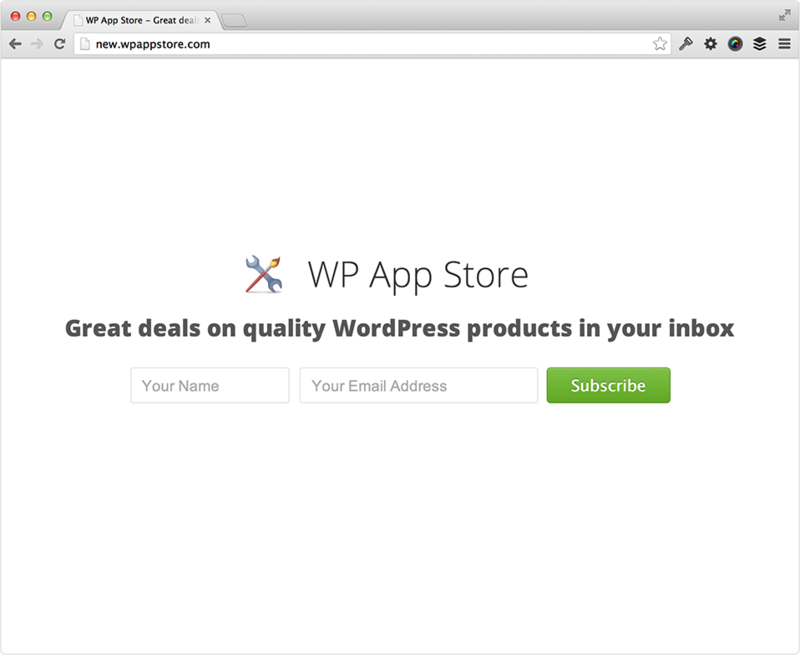 WP App Store has been rebooted as a mailing list for deals on WordPress products. 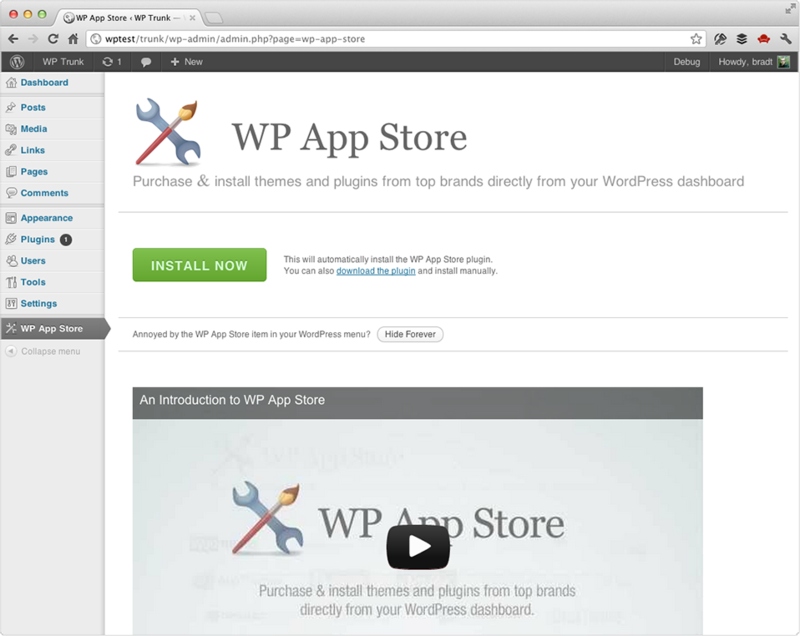 In May last year I launched WP App Store, a marketplace built-into the WordPress dashboard. The idea was to bring an Apple App Store -like experience to WordPress. I had gotten an excellent inventory of themes and plugins together from the most recognizable brands. Nearly everyone I talked to thought it was a great idea. I had great advisors cheering me on and some financial investment so I could focus 100% of my time on it. How could it fail, right? Well today, I shut down the store. I built what I had set out to build in terms of a technology but not in terms of a business. The sales were few and far between. There are probably a hundred reasons why it failed, but I’m only going to discuss a few that I think are most significant. Before we get into that though, I would like to announce that I’ve also rebooted WP App Store today. We have a pretty good size mailing list and I’ve established relationships with lots of talented people who sell great products, so I’ve decided to bring those two things together. Once or twice a month, I’ll send out an email to the list with an exclusive coupon code to get a percentage off some quality products for WordPress. That’s it. Very simple, but hopefully people will find value in it. Now, back to the reasons why WP App Store failed. If you’re at all familiar with running an e-commerce web site, you know that the tiniest obstacle between a customer and purchasing can have a significant impact on conversions. Years ago when I worked at ActiveState, I changed a select box with two options in it to two radio buttons, added a little extra copy, and visitor-to-trial conversions increased 50%. You can imagine the kind of negative impact the not-so-subtle obstacle of installing a plugin would have. But like I said, we knew this from the start, so we had a couple of strategies we were counting on to eliminate this obstacle. You may be wondering why we didn’t just add the WP App Store plugin to the WordPress.org repository so people could search for it and install it in just a couple steps from their WordPress dashboard. Unfortunately for us, marketplace plugins are not allowed in the WordPress.org repository. We checked. The first strategy was to embed an installer into themes and plugins. The concept was simple: get developers to add a snippet of code to their themes and plugins to introduce their customers to WP App Store and allow customers to install the WP App Store plugin with one click. The snippet that I developed worked great and WooThemes added it to all their themes. Unfortunately, their customers started complaining as soon as it was rolled out. Many didn’t know where the menu item had come from. They were confused by it. Some thought their site had been hacked and that it was spyware. Two months after adding it, WooThemes removed the installer from their themes. In those two months, we saw significant gains in registrations and sales, so this mistake was costly. Clearly the WP App Store menu item should have been tucked under the WooThemes menu item to make it clear that it was part of the theme. The second distribution strategy was to partner with web hosts and have them include the WP App Store plugin as part of their WordPress installs in exchange for a cut of the revenue. I was particularly interested in the web hosts offering low-cost shared hosting. Since they are dealing with such small profit margins, any additional revenue they can generate from a customer is significant. This tier of hosting also tends to be rife with do-it-yourselfers, setting up their own WordPress web sites. I wanted to create a flow for these people, where immediately after doing a one-click install of WordPress from their web host’s control panel, they would be presented with a screen to choose a theme from WP App Store. Once they choose a theme, it would bounce them to a screen to choose plugins to extend the functionality of their theme. I was pleasantly surprised by the initial interest from web hosts. I figured I’d have to reach out to them and expected that getting their attention would be a challenge. But just after launch, I had calls with a couple of large web hosts and there was a lot of enthusiasm. Unfortunately interest waned and they put the idea of a partnership on hold. Some said they wanted to see some traction first. And so it became a chicken and egg problem. Web hosts wanted to see traction first, but we needed them to get traction. Where is the painful, time sucking problem that people will step over their own mother for a solution? It seems obvious to me now that there isn’t one. In fact, it doesn’t seem to me that a marketplace really solves a problem itself unless the products it sells aren’t available anywhere else. Then the problem they are solving is making products available. The iOS App Store is the only place you can get apps for iOS. Most of the products on ThemeForest and Code Canyon are available exclusively from their marketplaces. In October (5 months after launch) I conducted some customer interviews over email and most of the feedback concerned our plugin catalog. I could count the number of quality commercial plugins on one hand when we launched. In the past year and a bit though, I’ve seen a few new ones hit the market that are exciting, but it’s not exactly an explosion just yet. I think we are close to a tipping point with plugins. Maybe similar to where we were with themes in 2008. It’s one hell of an opportunity for plugin developers. I can hardly wait to see more talented developers releasing quality plugins and building a businesses off of them. In November last year, on the advice of my advisors, I decided to refocus on a new venture: a pro version of my free WP Migrate DB plugin. We still chipped away at WP App Store here and there, making our product catalog available on our web site, redesigning the plugin listing, tweaking the WP App Store plugin, and finally just a few months ago, enabling purchases from our web site. Unfortunately, none of these changes made any noticeable difference to conversions. And so today, almost 2 years since I first started hacking at the code, I finally shut it down. maxfoundry.comThis Week In WordPress: Sep 30, 2013 - 3.7 Beta 1 Is Out! wordpressjackpot.comWordPress news: September 21 to September 28, 2013 | WordPress Jackpot!